The unit incorporates its own position controller allowing it to operate stand-alone or as part of a larger networked system. Velocity 2 offers unique features and performance in a very compact package. Engineered to deliver power and performance to high-end automation machinery, the highly flexible Velocity 2 offers capacities from 0.75kW to 110kW in a variety of sizes ranging from 4U, to flightcased drives, including custom cabinets and multiple drive systems. In most applications Velocity 2 offers a complete solution without the need for external ‘regen’ units or ‘braking resistors’. Instead, internal brake resistors and temperature controlled forced air cooling for quiet operation at 100% duty cycle are included. All drive and interface parameters may be accessed through the incorporated colour touchscreen display, which provides detailed diagnostic information and performance feedback. The Velocity 2 drive also includes manual controls for quick and intuitive local control when required. 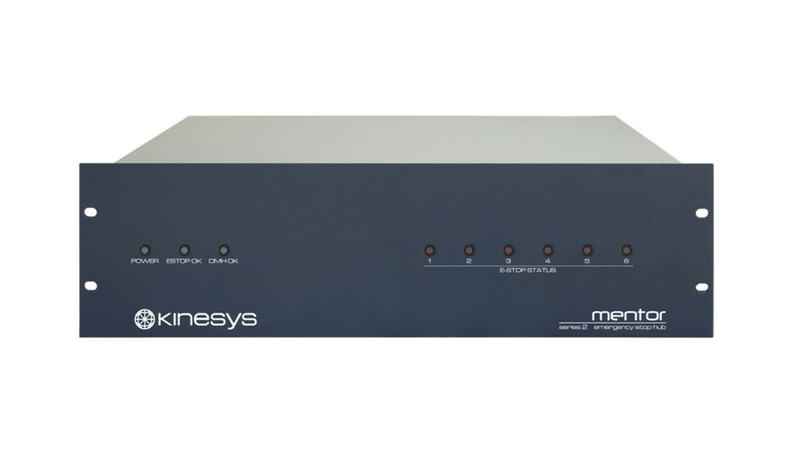 The Velocity 2 drive can be controlled by K2 or Vector software packages and interfaces with other Kinesys products for a totally integrated show control system. Mentor is a SIL3 safety controller line, comprising a range of SIL3 E-Stop combiners, aggregators and distribution modules.